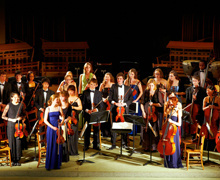 Wells Virtuosi is the chamber orchestra formed by the finest string players of the Wells Cathedral School. The earliest record of a school for choristers in Wells dates from 909, when the church of Wells was made a Cathedral. This puts Wells Cathedral School among the oldest schools in Europe. In 1970, twelve young violinists were admitted to the newly endowed Music School, whose building was officially opened in 1974 by Lord Goodman, then Chairman of the Arts Council. The decision to incorporate the Specialist Music Scheme means that Wells is the only one of the four Specialist Music Schools supported by the DfE to operate within the context of a proper school. Today it is a thriving co-educational school, incorporating choristers and talented musicians alongside the general school community. Although its Choir is internationally famous (as well as being over a thousand years old! ), the quality of the Wells Cathedral School orchestras is also formidable. The Strings department of the school is led by former pupil Matthew Souter of the Alberni String Quartet, frequent visitors to music@stansted, and the finest young musicians under his care form the 'Wells Virtuosi' chamber orchestra.